The Federal Building is typical of the eclectic revivalism which distinguished many public buildings of the time. Like the Beverly Hills Post Office, executed by Allison and Allison at the same time as this building, the stylistic expression is neither avant garde nor strictly classical. It is a well-preserved and locally prominent example of its genre - a small public building of the early 1930s. The original tempera murals mounted on the lobby walls are examples of the type of federally sponsored decorative artwork produced during the Depression, the only works of their kind in the city. As art, the murals are somewhat clumsily executed; however, as artifacts reflecting the social climate in which they were produced, they are important examples of the widespread social realist art movement of the thirties and forties. 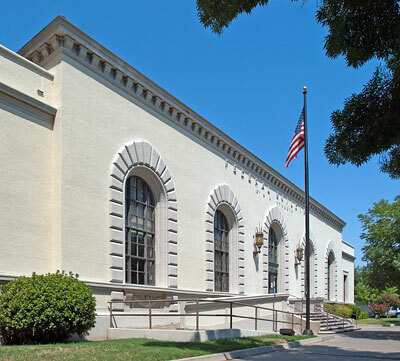 The Federal Building represents Merced's part of an extensive federal construction program initiated in the late 1920s by the Hoover administration. As the first federal building erected in the city, it was a source of pride for the townspeople and a locally prominent symbol of the federal government.